CADstudio DWGsign is an add-on utility for AutoCAD which watermarks your DWG drawing document (project, block or template) with a permanent invisible signature containing your or your company's name. This add-on tool helps to protect your intellectual property (IP) as you can prove the ownership of the original content in any future DWG files which are based on this signed document. Your original signature can be viewed using the free DWGsign Reader application. You can "sign" individual DWG files or your templates. If you sign your company template (.DWT), all new drawings based on this template will be automatically "signed" (watermarked). DWGsign does not prove unmodified state of the original document (like digital signature does), it proves that a document is based on your original data. Non-authorized users (even in your company) cannot remove the DWG signature. The signature remains part of the DWG file even if the DWGsign utility is not installed on a workstation. This application is compatible with the AutoCAD 2015, 2016, 2017, 2018 and 2019 families (64-bit, any language version). DWGsign is available in English, French and Czech. DWGsign adds the specified authorship signature in encrypted format to internal data structures inside the DWG file. This signature survives any future modifications of that DWG drawing. On the first run of DWGsign, you will be prompted to specify the location of your individual unique .sign file obtained with the purchased application. 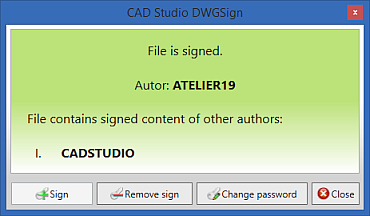 CADstudio DWGsign Reader is a free add-on utility for AutoCAD (+verticals) which checks any watermarks/signatures (added through the full DWGsign add-on application) in your DWG drawings. You can use it to verify and prove ownership of your DWG content on any AutoCAD workstation. Price of the DWGsign license is 99 USD. The application is licensed per computer, multi-license discounts apply. You will receive your unique .sign file with the encrypted specified text - e.g. your company name, plus a signature-removal password. You can download the free DWGsign Reader also from the Autodesk Apps store (click the icon).